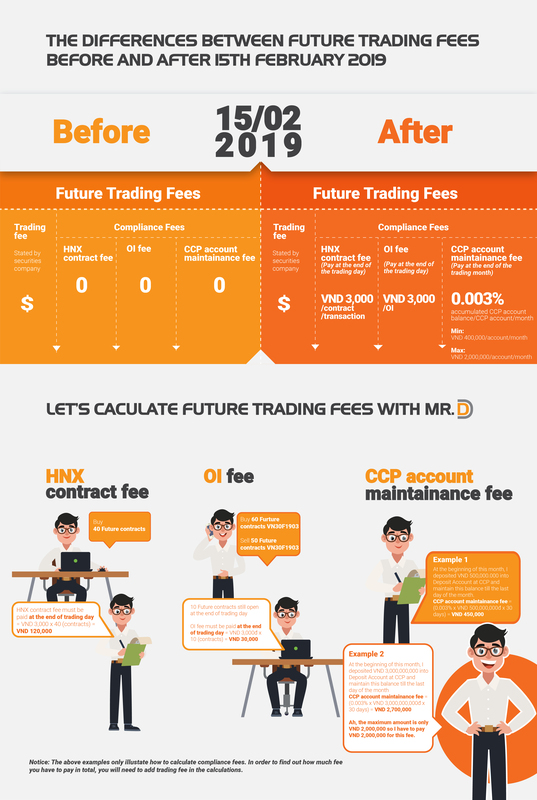 According to the provisions of Circular 127/2018/TT-BTC, from 15th February 2019, when trading VN30 futures, in addition to the transaction fees stated by VNDIRECT, there will also be compliance fees for Vietnam Securities Depository (VSD) and Hanoi Stock Exchange (HNX). 1. How many types of compliance fees are there? Answer: There are 3 types of compliance fees: HNX contract fee, OI fee, and CCP account maintenance fee. 2. Is HNX contract fee charged for each side transaction of a contract, or is it charged only once for both opening and closing transactions of a contract? Answer: HNX contract fee is charged for each side transaction of a contract. For example: you open 10 contracts and close 5 of them. HNX contract fee will be (10+5)*3,000 = VND 45,000. 3. Is OI fee charged on non-trading days? Answer: Yes. OI fee is charged on non-trading days if you hold open contracts through those non-trading days. The total OI fee which will be charged on Friday is VND 90,000. 4. If I deposit money into my Deposit Account at CCP at the beginning of the day but I withdraw all of the amount at the end of the trading session, will I be charged for CCP account maintenance fee for that day? Note: 16h00 is the cut off time for withdrawals. Your withdrawing transactions must be successfully completed by 16h00, otherwise any pending withdrawals will still incur a balance in your CCP account, thus incurring CCP account maintenance fee. 5. If I incur loss from my trading today, at the end of the trading session I won’t be able to withdraw all of the deposited amount in my CCP account (due to my loss VM), will there be any CCP account maintenance fee? Answer: Yes. For example: you deposit 20m into your Deposit Account at CCP. During the day you realize a loss of 2m. After the trading session, the maximum amount you can withdraw from your Deposit Account at CCP is 18m (due to a loss VM of 2m). In result, VSD will still charge you for CCP account maintenance fee on that 2m. 6. If at the moment, the balance in my CCP account is less than VND 5,500, which is not even enough for withdrawal fee, what should I do to avoid the CCP account maintenance fee? Answer: If you want to bring the balance of your CCP account down to zero, you can deposit an additional amount into your CCP account so that it surpasses VND 11,000 (deposit and withdrawal fees), and then withdrawal all of the amount to clear the balance. 7. When are those compliance fees charged on my account? CCP account maintenance fee: charged at the end of each month if your account incurs any positive balance during the month. 8. Which account are payments for those compliance fees withdrawn from? Answer: Payments for those compliance fees are withdrawn from your Derivative Account at VNDIRECT. 9. What is the minimum balance required for future trading? Answer: You will need to maintain a minimum balance of VND 400,000 in your Derivative Account at VNDIRECT. 10. What happens if my VNDIRECT Derivative Account does not have sufficient fund to pay for incurred compliance fees? If you don’t have enough money in your Derivative Account at VNDIRECT the at the time of paying compliance fees, these unpaid fees will be converted to overdraft. If such overdraft is still not paid off by 1pm of the next trading session, VNDIRECT will actively withdraw your money from your Deposit Account at CCP. In case the cash balance of your Deposit Account at CCP is not enough, VNDIRECT will force close your Future contracts to collect cash for the overdraft payment.